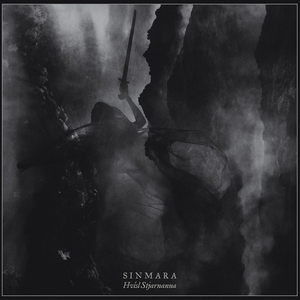 Coming from a scene blessed with an unnaturally high concentration of talent, Hvisl Stjarnanna is the record that finally pushes Sinmara to the vanguard of Icelandic black metal. Since forming in Reykjavik a decade ago, the enigmatic quintet has released a gnarly debut, two splits, and an excellent EP, with each bringing further refinement to the band's disso-dominated beginnings. At a sprawling 42 minutes of celestial-worshiping black metal, Hvisl Stjarnanna shows that Sinmara is keenly aware of their scorched roots, but have eyes to the stars above. They've come to understand how important the balance between harmony and havoc - a particularly dubious quality to master - can be in the realization and execution of a truly compelling black metal album. And it's not just the fact they now posses such intensely melodic arrangements within their Deathspell Omega-inspired cacophony - it's how they wield them. Despair dresses the introduction to first track "Apparitions", but Sinmara's newfound duality is immediately recognizable in following song, "Mephitic Haze". Though birthed in a stormy miasma of tuneless atmosphere, bolts of melody soon pierce through the tumult, their tendrils proliferating a grey-hued sky. Their focus on creating a neigh impenetrable wall of sound hasn't shifted per say, but they've learned to embellish. With a widened palette comes nuance, as each track -especially the standout number "Crimson Stars" - displays a considerable amount of character and depth that begs to be revisited. While that same density could possibly prevent some from returning, upon repeated listens these intricacies become more welcome, each point of disparity evolving into its own defining moment. As a culmination of their career contained within the confines of a singular album, Hvisl Stjarnanna is the ideal showcase to display just how far the band has come in the ten years since their formation. It feels impossible to deny Sinmara a spot in the pantheon of the Icelandic scene now. It's a distinction they rightfully deserve, as not only one of the best bands to come from their home country, but one of the best in the genre. I actually didn't think there was too much to say about this album, but regardless I very much enjoyed it. Up there with the best in black metal so far this year. Lost track of these dudes after the amazing debut, definitely gonna revisit that and listen to this. Review is a great service to what the album aims for, well done. 42 minutes is also a rather comfortable runtime, not too short and not overly-indulgent. Thank you both! Appreciate it! Yes, this rules from what I've heard. glad ya'll are enjoying it! Way more interesting than their debut. Excellent stuff. I love their other stuff too but yeah this is their best release so far by a wide margin. Nice review. I agree. Sinmara knows when to use melody and how not to overuse it. That puts this very high on 2019.
ruinous black metal, i dig.